Have you ever been told to stop making something more difficult than it is? Or how about being told that there is/was an easier way to do what you are doing? Does this sound familiar to you? Do you do something the same way every time, because you always have done it "that way", and there is no point in changing it now? I recently discovered an easy way to do something; something that in the past was very difficult to do. I went into the task assuming the worst, using my past experience to dictate my approach this time around. I'm talking about giving our wiry little cat a pill - every day. In the past, Jason and I have given up on this. We would let the seven pound fur ball get the best of us. Popping a pill in her mouth and coaxing her to swallow was not an option. Hiding it in food or in a special pet "pill pocket": she's too smart for that. Now, I feel like she really is smarter than me, because giving her a pill is easy. All I needed to do was crush up the pill with a mortar and pestle, and mix it up with a "treat" food. So easy - every time. People change. Needs change. Be open. I'm always looking for easy and convenient ways to do things. In particular, how to eat more salad(s). 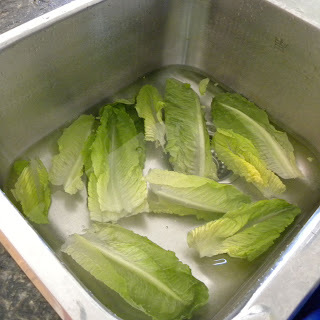 It can be so draining to pull out the head of lettuce, wash the lettuce, dry the lettuce, grate the carrot, slice the tomato...you get the picture. Then I discovered how to store clean romaine lettuce in the fridge - for up to one week! 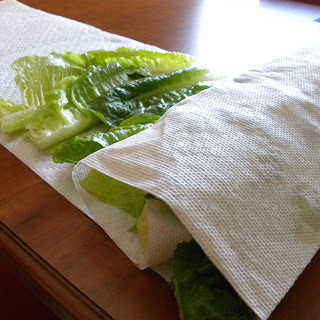 MS or not, this is good for everyone (unless you don't like romaine lettuce, I haven't tried it with any other green leaves). 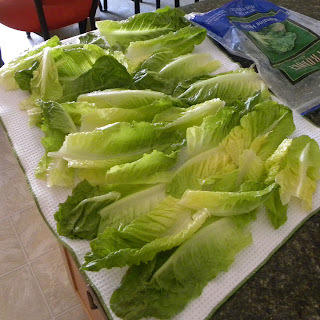 Then slide it into a plastic bag (I use a ziploc freezer bag) and seal it up. When I need some lettuce, I just open up the bag and pull out what I want.